If you are not into zip lining, the Hanging Bridges Tour is a great way to explore Costa Rica’s exuberant tropical forests from all perspectives while enjoying magnificent views. This tour is the best way to observe complete views of the forest canopy and have access to a different ecosystem that can only be discovered at the highest points of trees. Around Arenal volcano area, in La Fortuna de San Carlos, there are multiple tour locations that offer the hanging bridges experience. Two of the most popular locations are Arenal Mistico Park and Sky Adventure. 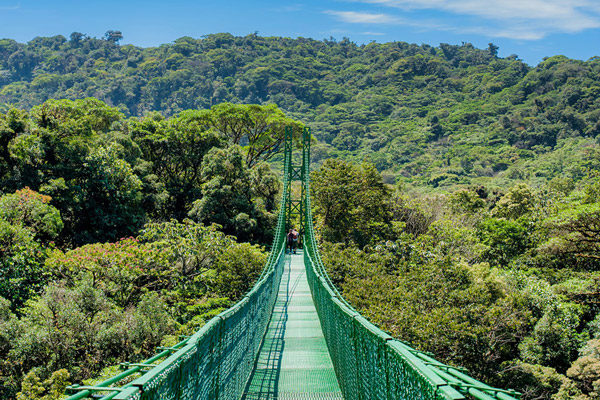 Monteverde Cloud Forest is another destination worth visiting, with multiple routes and bridges to choose from. Sky Adventure and Selvatura Park offer the best walkway suspension bridges in the area. The hanging bridges is a tour that can be enjoyed by people of all ages and physical conditions. Even though travelers can take the option of self-guided tours, we highly recommend tour guides in order to learn the secrets of the local flora and fauna, while immersing yourself in the natural history. A naturalist guide will point out intriguing plant and animal life, so you won’t miss out on amazing details these forests offer. The expert eye of the guide will give you a valuable opportunity to appreciate the balance of the mystical life that happens every moment during the guided tour. In all Costa Rica Dream Adventures customized vacation packages, an English certified bilingual guide is included during each activity. To learn more about the activities we offer in each area, click here for a list of all of our tours. This activities can be incorporated into your customize vacation package. Mistico Park is a natural paradise that spans across 650 hectares, including 250 hectares of protected tropical rainforest reserve. It has an ideal location across from the majestic Arenal volcano. Its variety of wildlife and protected area has allowed the passage of large mammal species such as Pumas, Jaguars, and Tapirs. It’s also an ideal place to observe plant life as there are more than 700 species including trees, lianas, epiphytes, and herbs. There have been more than 350 bird species spotted here, including highland, lowland, and migratory species. Arenal Mistico Park Hanging Bridges offers a revitalizing hike along its world famous hanging bridges and trails. Here, you’ll have the chance to walk for 3 kilometers. There are 16 bridges in total, 6 of which are hanging. You can also go on a night hike to see reptiles and amphibians such as frogs, snakes, and lizards, as well as mammals such as kinkajous, raccoons, or margays. Rates: $40. If included in Costa Rica Dream Adventures package, transportation to and from the hotel included. In Arenal and Monteverde, Sky Adventure, founders of the first hanging bridges in Costa Rica, offer visitors hanging bridges with distances up to 236m (774ft) and heights up to 70m (230ft). Trails and hanging bridges are designed and maintained to cause the lowest impact to nature, trying always to keep the forest intact for everything living in it. 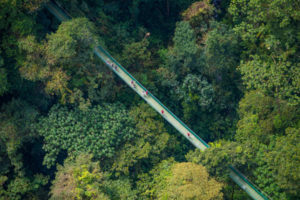 Sky Walk hanging bridges are perfect to appreciate Costa Rica’s magnificent and world recognized biodiversity by walking and admiring nature from different perspectives. Schedules everyday: Arenal: 7am, 8am, 9am, 11:30am, 12:30pm, 2pm. Restrictions: Child rates from ages 5 to 12. Check-in is 15 minutes prior to the booked tour start time. Rates: $41-$28. If included in Costa Rica Dream Adventures package, transportation to and from the hotel included. 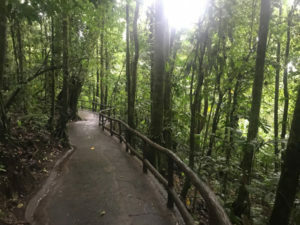 Selvatura Park’s treetop walkways provide visitors the opportunity to observe a wide variety of flora and fauna of Monteverde Cloud Forest. The treetop walkways tour consists of 1.9 miles of trails in which visitors will encounter eight bridges of various lengths that range between 170 feet and 560 feet. 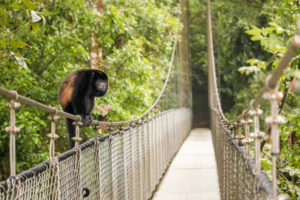 Each bridge features 5 foot width and the largest capacity in Costa Rica of up to 80 people per bridge, which makes the treetop walkways at Selvatura Park not only the longest bridge system in Costa Rica but also the safest and strongest. Comfortable clothes and footwear. Long pants. Rain gear. Bring a jacket or raincoat, just in case a friendly rain comes by.